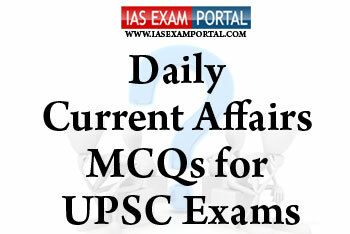 Current Affairs MCQ for UPSC Exams - 20 JANUARY 2019 | IAS EXAM PORTAL - India's Largest Community for UPSC Exam Aspirants. Q1. Which of the following statements with respect to Gram Panchayat Development Plan (GPDP) are true ? 1) The GPDP will be an intensive and structured exercise for planning at Gram Sabha level through convergence between Panchayati Raj institutions and concerned departments of the State. 2) In view of the large scale of the campaign, a special social media campaign has been launched to ensure itsoutreach to the community. This will consist of information about the Panchayats and about the Gram Panchayat Development Plan. Q2. Which of the following statements regarding India’s light combat helicopter (LCH) are true ? 1) The LCH is the only attack helicopter in the world which is capable of operating at altitudes as high as the location of Siachen glacier. 2) This advance sighting system will enable the pilot to launch a missile onto any target without having to turn the helicopter. 3) It was built in collaboration with France under Project-75. 1) Angel tax is a term used to refer to the income tax payable on capital raised by unlisted companies via issue of shares where the share price is seen in excess of the fair market value of the shares sold. 2) It was introduced in 2012 budget with an intention to curb money laundering in the country. 3) There is complete and full exemption for start up companies from paying angel tax since the introduction of GST. 1) As of now ,the PMAY (Grameen) scheme to provide housing for the rural poor has achieved only 66% of its target to complete one crore houses. 3) Under the scheme, maximum land allocation has taken place within a quick time span in Bihar. Q5. Which of the following middle east countries shares boundary with Yemen ?